Winter is here. Snow has fallen on all of the GDT and is accumulating so expect wet, icy and slippery trail conditions. Heavy boots, snow cleats or snowshoes are recommended. Temperatures are below freezing, so be prepared for winter conditions and short days when travelling into the backcountry this winter. Remember that the GDT is not designed for snow travel and is not maintained in the winter. When the trail is covered in snow, finding it may be impossible so excellent navigation skills are required. Hiking on the GDT when it’s snow covered means exposing yourself to potential avalanche risk. In many places, it’s unwise to travel the trail during these conditions. While planning your hike, research snow conditions and check out the Canadian Avalanche Centre for the latest avalanche bulletins. Due to the Kenow wildfire, all trails and backcountry campgrounds in Waterton Lakes National Park and Akamina Kishinena Provincial Park remain closed. The GDT is closed from the International Boundary (a1) to Sage Pass (a17). No detour is available. Due to the Verdant Creek Wildfire, the GDT is closed from Citadel Pass (c13) to Sunshine Meadows (c15). Detour around the closure by leaving the GDT at Watridge Lake trail junction (c7) and rejoin the GDT at Sunshine Village (c15). Jasper National Park seasonal closure – The GDT is closed from Four Point Campground (e15) to Signal Mountain Trailhead (e32) from November 1, 2017 to February 28, 2018, to prevent trails from facilitating an unnatural level of predator access to threatened woodland caribou. Numa Creek Trail (Rockwall access trail) remains closed due to wash out of the bridge over the Vermilion River. Tumbling Creek Trail (Rockwall access trail) is closed from the Ochre Creek trail to the intersection of the Rockwall Trail before the Tumbling bridge due to a missing bridge at km 6.6. Approximately 35 km of the GDT was burned by the Kenow Wildfire between Bertha Bay campground and Font Creek (a19). We will have to wait until next summer to determine the full extent of the damage. Some trails that have been damaged by wildfire may require environmental analysis or heavier engineering, and closures could be in place for many months, for the health of the trail and the surrounding landscapes as well as the safety of hikers and volunteers. The GDTA will continue to monitor and assess the condition of these damaged trails and provide updates as they become available. From Scarpe Pass (a24), the trail disappears so hikers must route-find up to La Coulotte Ridge, where the hiking becomes significantly more difficult until you reach the ATV track (a27) heading down to the West Castle Road. A large avalanche has destroyed about 200 m of trail north of Dutch Creek campground, near Tornado Pass (b16). Hikers should traverse the scar area around the down slope side so as to avoid climbing over unstable fallen trees. Leroy Creek has washed out approximately 100m of the trail obscuring the location of the creek ford. Look for cairns on either side of the creek marking the crossing. There is a new bridge over the Upper Elk Lake outflow (b38) and a new bypass trail to Fox Lake and West Elk Pass just before the bridge. A windstorm blew through Yoho National Park in July 2017 resulting in many blown down trees – On the Ottertail Trail, there are several debris fields with fallen trees across the trail near Goodsir Pass (c36). On the Amiskwi Trail, about 1 km from the trailhead (d1), there are dozens of trees blow down across the trail. Cairnes Creek (d9): The bridge is washed out making this a potentially dangerous ford. There are 2 large trees down across the creek allowing hikers to cross. If these trees wash away, it is recommended to ford the creek early in the morning when glacial melt is lowest. The damaged Lambe Creek bridge (d10) was removed in September 2015. It is recommended to ford downstream where the creek is wider and shallower, and cross early in the morning when glacial melt is lowest. The Howse Pass Trail from Conway Creek (d12) to the Glacier Lake trail junction (d14, 15 km) is in very poor condition. The trail is overgrown, with hundreds of wind-fallen trees across the trail. Hiking in the Howse River floodplain is recommended when the river is low enough to safely ford. The Owen Creek Trail was cleared in July 2015 up to km 6 but there has been some new deadfall since then. Beyond that point, the trail is in poor shape with several washed out sections. Expect challenging hiking for 3 km including skirting along steep creek-side cliffs and rock-hopping in the creek itself. At km 6, do not take the trail heading up away from the creek (it is a deadend). Look for orange blazes marking the correct route staying near the creek. The Maligne Pass trail in Jasper National Park has been decommissioned and is in poor shape. The trail from Pobokton Creek (e20) to Maligne Lake (e25, approx 42 km) is no longer being maintained by Parks Canada so expect deteriorating and overgrown trail conditions; long pants are recommended. The Maligne River bridge has been removed but the river can be easily forded in normal summer conditions (knee deep in mid-summer). Most other bridges are still in place. 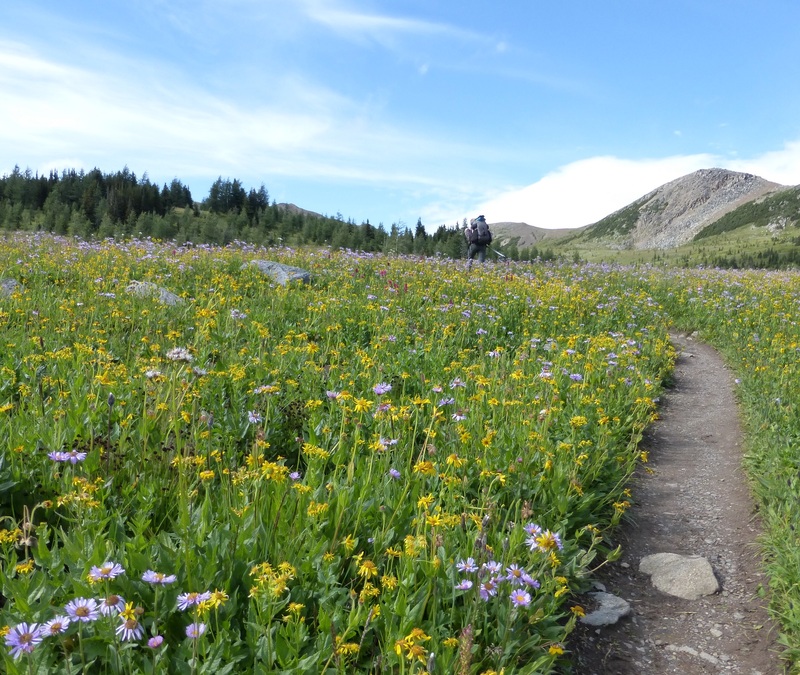 Read Nathan Dahl’s August 30, 2015 Maligne Pass trail update here. The Six Passes Route is a good alternative to the overgrown trail. The Yates Torrent Bridge is out at the crossing of the Coleman Glacier outflow (near f16). Do not attempt to cross at the old bridge location. There are two options: (1) ford the Smoky River in the floodplain; or (2) ford Yates Torrent approximately 500m upstream (location was flagged in 2017). At both locations attempt to cross early in the morning when glacial melt is the lowest or be prepared for a fast and potentially dangerous creek ford. The bridges across Gendarme and Carcajou Creeks are out on the Jasper North Boundary Trail. These two creeks are smaller than the Smoky River, but can still be treacherous. Cross Gendarme at the horse crossing just below the old bridge (marked), and Carcajou about 100m below the trail. The bridge across Buchanan Creek on the trail to Kakwa Lake, has been removed. The crossing here can be hazardous early in the year or after heavy rains. Akamina Parkway and Red Rock Parkway in Waterton Lakes National Park are closed. Highway 40 will be seasonally closed from Peter Lougheed Provincial Park to Highwood House beginning December 1. Forestry Trunk Road 940 will be seasonally closed south of Cataract Creek and northwest of Plateau Mountain Road beginning December 1.